Sloty is a budding casino that is shaking the entire iGaming industry with its tremendous promise to become a major player. Despite the casino’s relatively young age in the industry, it has proved a point that it is here to stay. It boasts of a multitude of entertaining games cutting across the entire gaming spectrum, crazy bonuses and promotions, massive payouts and zero charges on all deposit and withdrawal methods. Play at Sloty Casino Now ! Sloty casino is owned and managed by the Genesis Global Limited Casinos Group. The group is credited with running with a number of reputable casinos that are preferred by a vast majority of the online gambling enthusiasts; novices and experts alike. The casino is headquartered at Malta, one of the most popular countries in the world when it comes to respected casino gaming providers. The geographical positioning of the country in Europe gives it a strategic advantage in lieu to the many expatriates who work and live in the region. Sloty casino is licensed and regulated by the Government of Malta. 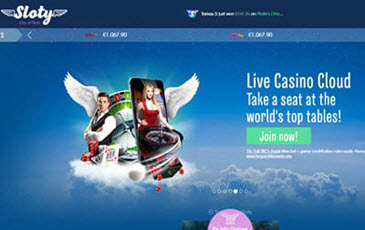 If you are still in doubt over the legitimacy of the site, then it will interest to know that the casino recently received an award from the UK Gambling Commission for its commitment in offering a customer-centric gambling experience. Now that’s the perfect definition of a great and reputable casino. Sloty has over 791 casino games out of which 400 games can be accessed via a mobile handset. The table games selection here include Multi-Hand Vegas, Pai Gow Poker, Gold, Blackjack MH, MH, Big 5 Blackjack Gold and Casino Stud Poker. Slot titles here include Golden Legend, Mystery Joker, Robin Hood Shifting, Irish Gold, Ace of Spades, Green Lantern and 300 Shields. If you are a lover of Video Poker a few of the titles at Sloty include Joker Poker, Jacks or Better, Aces and Faces, Double Joker, All American Tens or Better and Bonus Poker Deluxe. Live Dealer ethusiasts are also covered with the likes of Caribbean Stud Poker, Three Card Poker, Dream Catcher, Baccarat, Blackjack and Roulette. Speciality Games include Flying Pigs, The Alien Attack, Triangulation, Germinator, Premier Racing and Pick n’ Switch. Sloty casino is the home of top-rated and highly coveted bonuses and promotions. The following are the main bonuses and promotions that are typical of any gambler’s experience at the casino. Monday is equally a special day that warrants goodies from Sloty casino. In this two-part award that benefits all players that have once made at least two deposits since they registered with the casino. The first part consists of a 50% bonus to a maximum of $100 and comes with a 40x rollover. Besides the bonus, you also get 20 free spins on the same game of the week. This is the bonus that will light up your day no matter how unproductive things have been for you. When you deposit at least $20 between 8-9am or 8-9pm GMT, you are entitled to 10 free spins released to you the following day. The Extra Mile Bonus, has got you covered just in case you didn’t get enough of the Daily Happy Hour Bonus or any other bonus for that matter. The bonus lets you claim up to $100 and, yes, it comes with a 40x rollover. If you had made a deposit of whichever amount in the previous seven days, then you are eligible for this bonus, which runs every Friday of every other week. Sloty casino’s VIP Club is one of a kind. It grants you a member special privileges that will always remain a dream for the regular members. For instance, the moment you become a high rolling member of the casino, you are assigned a personal account manager that is at your beck and call. You also get frequent exclusive invitations to top-rated events and tournaments. Not just that, if you have always wanted to travel and see the world, Sloty casino’s VIP might just be your ticket to do that and so much more. There is much amazing stuff that can be said about Sloty casino. But, why don’t you explore for yourself and attest to the greatness that the casino has to offer? Their registration process is one of the simplest things you might have done in your history of gambling.